To The Future Public exhibition is organized in association with KMMN, a platform for international encounters and exchanges during the documenta 14 in INTERIM from June 10th2017 to September 17th 2017. The exhibition reactivates the projects that took place in the context of To The Future Public program and other projects by C.A.S.A. and introduces them to a broader public. 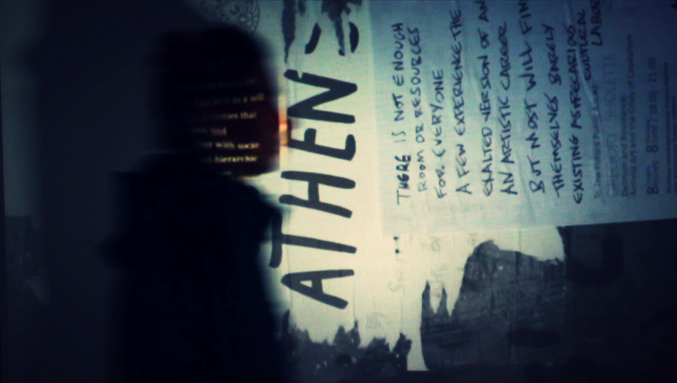 The curatorial format developed for the exhibition comprises of audiovisual screenings and interactive maps of Athens, on which material is presented embedded in the city, together with information about the social framework surrounding the works, information behind the spaces and locations in which the various projects took place, and collaborating groups. A vehicle for multiple narratives - the material presented ranges from recorded interviews, documentation of public performances, documentation of workshops, talks, and text by participants. The exhibition is developed as a collective artwork and an activistic tool of engagement. KMMN is a project by students and teachers from the Kunsthochschule Kassel to create a platform during the 100 days of documenta. A place for international exchange, a modular meeting and access point for international students and lecturers who come to Kassel to visit d14. The name plays with the pronunciation and possible meanings of the English word COMMON (togetherness, public, expanse) and the German word KOMMEN (come), similar to AnKMMN (arrive, come in) and Will-KMMN (welcome). Furthermore, KMMN offers visitors a constantly changing 100 day dialogue that includes lectures, presentations of images and videos, talks, workshops, performances, and exhibitions.